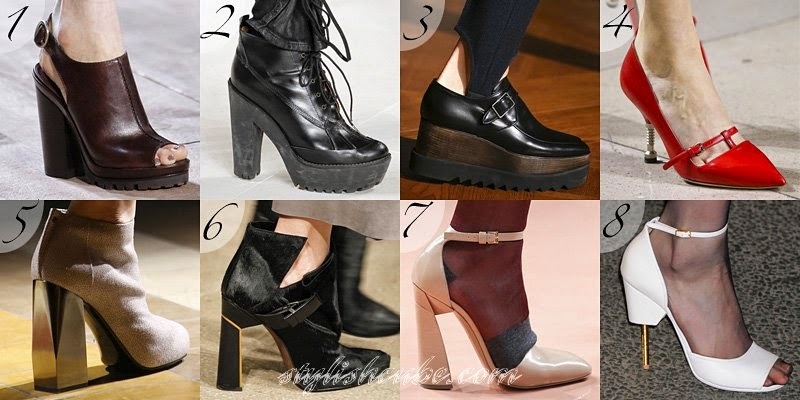 [Fall Winter 2014 -2015 Fashion Trends]- Women's shoes fall 2014 – is a fresh modern look at the classic elegance. Designers offer women choose bold and bright image that reflects femininity, strength and individuality. Perfect geometry, elegance of forms, noble materials and colors – these are the main tools of the season for creating spectacular image. Shoes Mary Jane begin to leave the top of popularity. 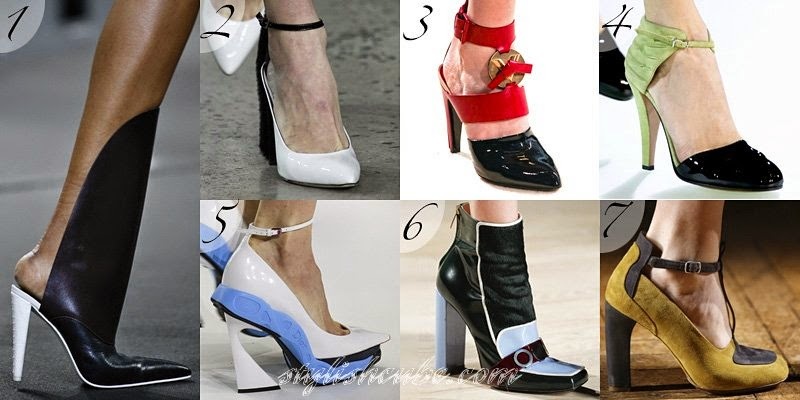 Leading trend of women's shoes is their closest analogue - shoes with ankle strap and a T-shaped clasp. 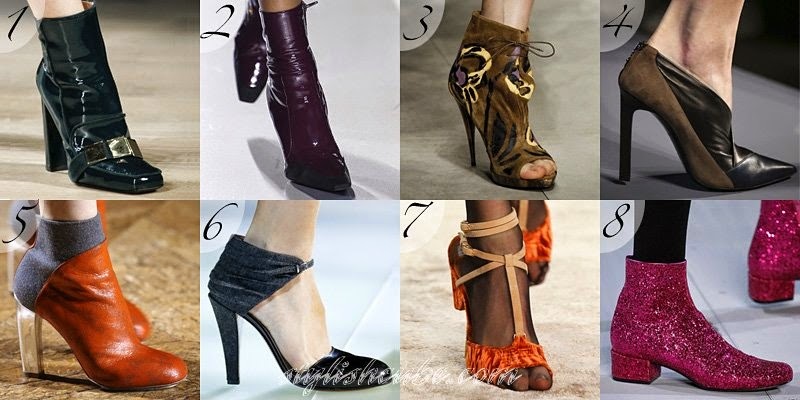 Shoes-mulas remain in the list of must have accessories, once again proving the right to substitute any shoes. Variety of options and attractive ideas within a style are capable of impressing. At the same time, they are practical and comfortable. Obviously, mulas settled in the wardrobes of fashionistas for more than a year. Loafers and their form continues to serve as a source of inspiration, however, the conventional design was a rare visitor to the podium, giving the way for seductive heeled versions. Otherwise, the preference is given to pumps and closed models with restrained design. Elegant shoes with heels, rough shoes on a massive sole, in men's style and chelsea have every right to be in the autumn wardrobe. Particular attention is paid to the elegance of design and details: in conjunction with the right coloring, texture and balanced volume, even thick sole with relief pattern does not cause excessive feeling. In the design of ankle boots one does not feel old coquetry, it is replaced by the refinement and practicality. Extravagant solutions are fading into past, in the foreground there are flawless graphics and interesting material texture. 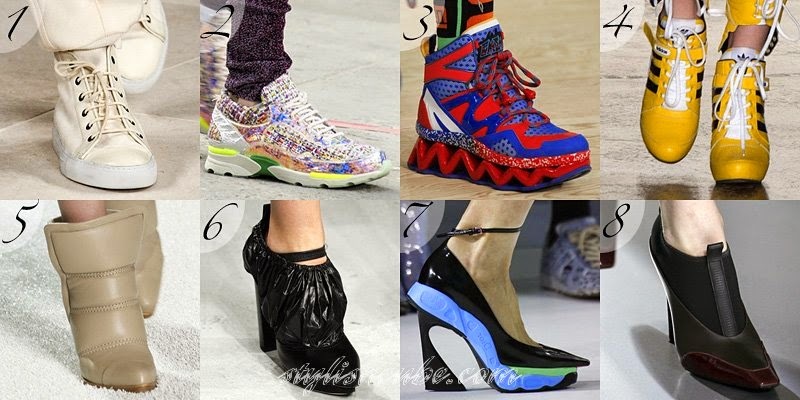 Sports trend in the design of women's shoes is experiencing a new metamorphosis: sneakers and boots with the same design are also in the collections of labels, but such straightforwardness pales into insignificance. 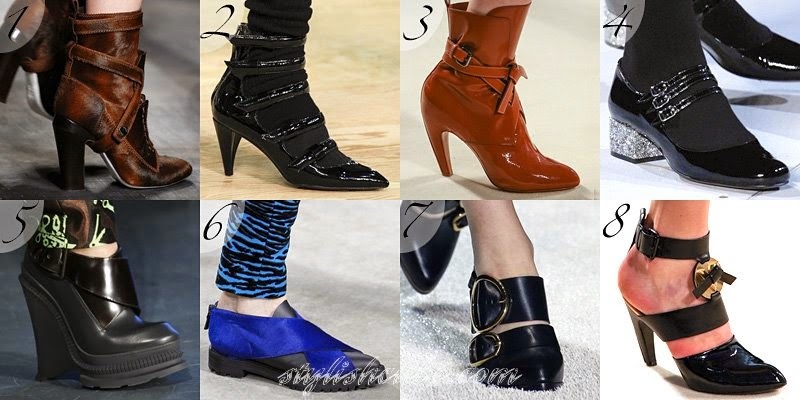 Shoes for fall 2014 are characterized by unusual details with a sporty character, which contrast with the overall performance. The sole of women's shoes is distinguished by industrial uncompromising architecture. Except straight lines and deep relief, its design includes metal parts, including unconventional ones, for example, a screw-pin. Accent on the toe and diagonal lines that emphasize the beautiful bend of the instep are in fashion. Shoes with cutouts remain on the fashionable wave, but not as a trend. Typically, this method is used at the level of the original decor, and not a challenge. Straps are a popular design element. This usual method allows to make performance more interesting, add complexity, playfulness, sophistication or even roughness, to emphasize the style and make the right accent. 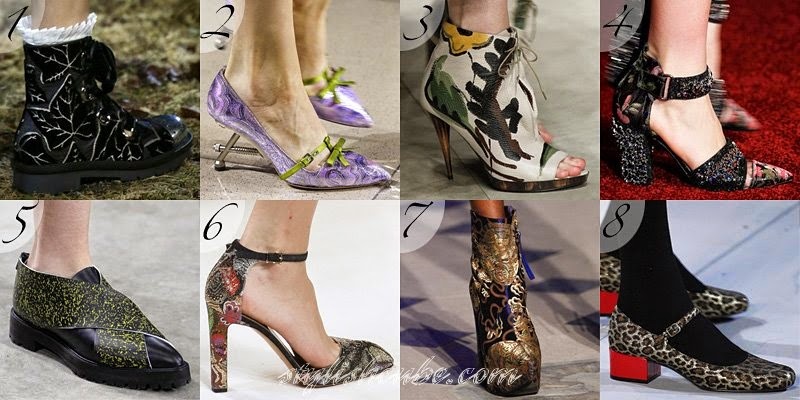 The materials are leather of reptiles and its imitations are a leading trend of women's shoes. Apart from the traditional colors, original color is in fashion, for example red, blue and green colors, both saturated and pastel spectrum. Short fur does not lose its positions. The approach to the choice of colors has changed, patterns are elegant and spectacular. Among the new products are sheepskin and unusual decor solutions with fluffy kinds of fur. Originality lies in their skillful use, which does not allow to cross the line of vulgarity. Lacquered gloss and glitter of sequins, velvety surface of velor, suede, fabrics and their combinations are wide-spread. Women's shoes from felt, popular among the mass market, in the new season appeared on fashion shows in several collections. The felt is used as a base or a companion in combinations of textures. Designers use two or three colors for design in the art of color blocks. The main are black and white and red and black combinations, but their choice is not limited. Separation takes place on the structural elements of shoes and amplified using contrast materials. Besides black, white, brown and beige, color palette contains noble tones of burgundy, blue, green, bright red and orange, soft pastels of mint, blue and peach. Silver, gold and bronze – are exclusives, which are chosen with care. Unlike autumn boots, prints are not uncommon for shoes, boots and ankle boots. Floral painting, ornaments and abstraction seized the first place, although leopard and check enjoyed a certain popularity. 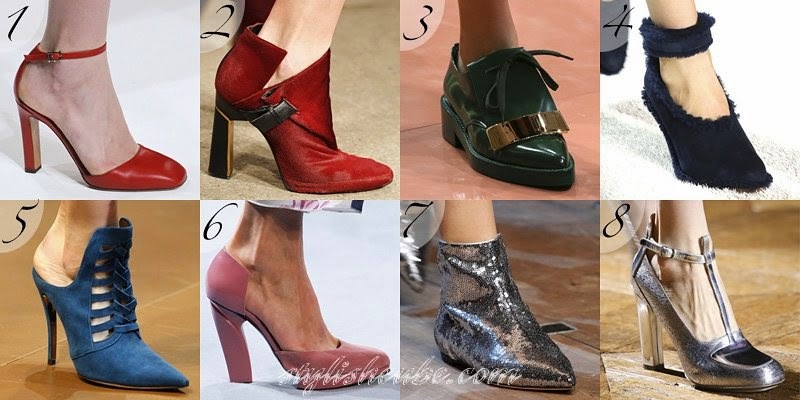 Bright decor – is not a frequent occurrence for fashionable footwear fall 2014, but if it is present, it turns an accessory into an exclusive. Placers of colored stones, crystals and embroidery seem to get out of the studio of a jeweler. The exception is strict models with metallic finish.